Well, we are finally back from Alaska! It was an absolute blast spending time with friends and family while enjoying the outdoors. I will say I am glad to be back though. The boys missed home, and I missed our schedules. I just wish we could get back on NJ time, because here I am at 1 am writing a blog post and catching up on Bachelor in Paradise. Please tell me I’m not the only one who watches this? Its so bad, yet so good! On another note, I know another white lace blouse was not exactly what my wardrobe was needing these days, (I seem to have an obsession) but I couldn’t pass up this adorable number. I love the bell sleeves, and the crochet detailing. Plus, I just can’t get enough of dolly tops lately. This floral on stripe dolly top is another favorite of mine. Did I mention its currently on sale for an extra 15% off? You just can’t pass up a deal like that! I hope you all love it as much as I do. I love this top! It is so feminine and the details are amazing. 🙂 You look as gorgeous as ever! 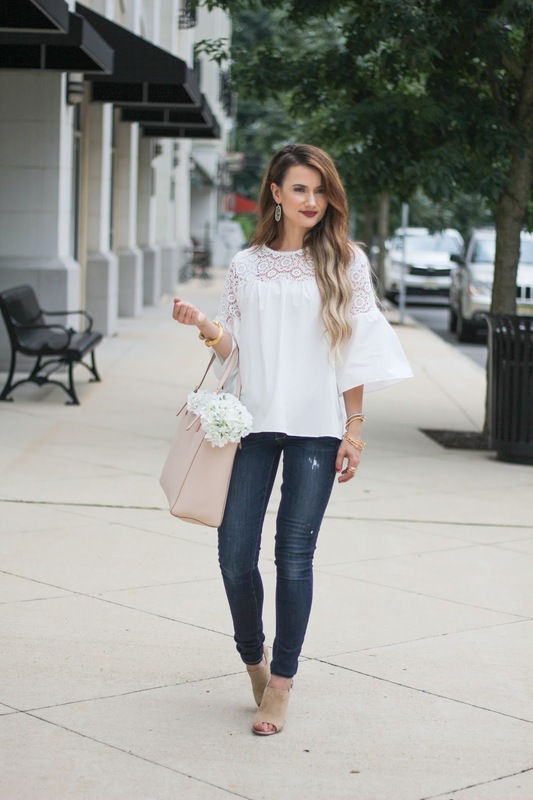 I love this ultra-feminine top! Hope you had an amazing summer Bethany, you look gorgeous as always! This is the cutest top! I love the details around the neckline. I love the crochet detailing! Isn't it heaven!? Thank you so much!